Born in 1943, Cecelia was raised by parents and grandparents who spoke nothing but the Nuu-chah-nulth language to her during her first years of life at Nootka Cannery and Yuquot. Her father was Chief Mike Tom Sr. and her mother was Josephine, from the Jack family of Mowachaht/Muchalaht. “My mother never learned English, she was an only child and her parents, Charles (also known as Captain Jack) and Mabel, would not let her go to school,” she shared. And so, Cecelia grew up immersed in the Nuu-chah-nulth language. Everyone around her spoke it and there was no use for the English language at the time. Tom said her parents, concerned for her safety, held off on sending her to Christie Indian Residential School. “I was about seven years old and didn’t know a word of English when I went to Christie,” she recalled. What she doesn’t remember is how and when she learned English. “I just remember that I was punished if I talked my language,” said Tom. When she was younger punishment included standing in the corner, being hit with a strap or slapped across the face. When she learned how to write in English she was punished by writing lines. “I had to write ‘I will not speak Indian’ one hundred times,” she recalled. The only time she got to speak her language during her school years was when her mother came for a visit. And it was through that language connection with her parents that she was able to continue speaking Nuu-chah-nulth later in life. At first there were some people in her life that were also fluent speakers. She could talk to them regularly. There were her aunts Alice Paul and Jessie Sye, or her late brother Mike. She would also speak the language to her nieces, nephews and grandchildren, in an effort to pass it on to the next generation. “I don’t know how I kept it…it just stayed with me,” said Tom. “Right now I speak it to myself,” she added. Tom is helping to help teach her six-year-old grandson the language and she began talking to him while his mother was pregnant, just like she did with her daughter and other family members. “I talk to (grandson) Michael in our language all the time and he understands,” said Tom. She said she makes it a point to teach him at least four words a day. “Hopefully, it will stay with him,” she said. Tom is grateful for the language and culture programs offered at Tseshaht’s Haahuupayuk School. She believes it will go a long way to helping Michael retain his language and culture. Besides teaching her younger family members the Nuu-chah-nulth language, Cecelia was sometimes contracted to teach language programs when she lived in Victoria. Since moving to Port Alberni she’s been focussed on teaching her grandson and is proud of his achievements. 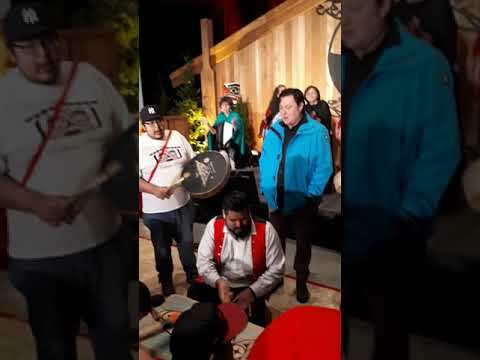 “His mother sang and danced while carrying him and now he’s a singer and dancer,” Tom said, proudly pointing to his collection of drums hanging on the wall. “It’s really up to the parents and grandparents to get really serious about this and talk to the babies because that’s when they learn,” she advised.